A couple of weeks ago it was -24C out with snow to the thighs. But a bit of warmth, a bit of sunshine triggers action. 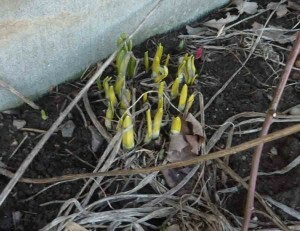 Even as the snowbanks sink, the daffodils are pushing up. They don’t care if it freezes or snows again. It’s spring even if they have to make it themselves. Warmth in the day also means the sap is running in the maple woods. 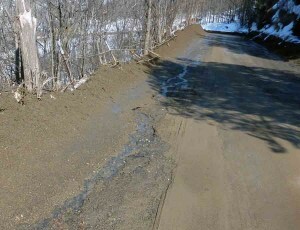 We shall stuff ourselves with pancakes and maple syrup when Maple in the County rolls around. Briefly, it rained instead of snowed, something not seen since November. Back at the beaver pond, three beavers were out repairing the roof of their lodge and trekking about in the snow, tempting coyotes and shedding cabin fever. The ice must be soft enough for them to hack their way up to the open air. Now one waits for the very first red-winged blackbird to hurry back from Mexico. They make it officially spring! Pair of socks by the side of the road. 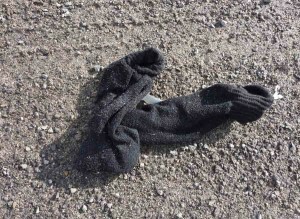 Who rips off their socks and flings them out the car window while snowbanks remain? Previous Previous post: Spring! First Surprise Glimpse! Next Next post: Geese – Flying South?